ALL OUR COMMERCIAL PROPERTIES ARE CURRENTLY FOR LEASE OR SALE. CLICK THE APPROPRIATE PROPERTY ABOVE FOR MORE INFORMATION. 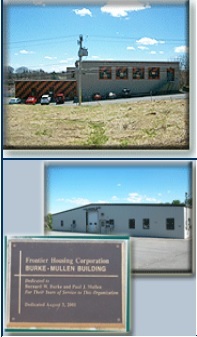 Frontier currently owns two commerical properties, the Industrial Center and the Burke-Mullen Building. For information on leasing or buying commerical space from us, please click the appropriate property . For more information on the particular properties, please click the appropriate button to the left.